While Wii Sports Resort currently has 100,000 more players reporting data than New Super Mario Bros. Wii(and Wii Fit Plus), New Super Mario Bros. Wii is gaining hours and players reporting data on a faster basis, than Wii Sports Resort did when it released. I wonder how long it will take New Super Mario Bros. Wii to catchup with Wii Sports Resort. Wii Sports Resort's Amazon.com sale rank was #2 and it's MSRP is $49.99. 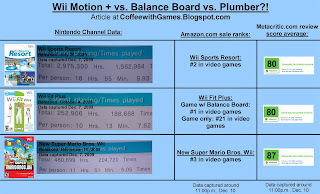 Wii Fit Plus' Amazon.com sale rank was #1(game with board) and #21 for just the software. The MSRP for the game with Balance Board is $99.99, and the MSRP for just the software is $19.99. 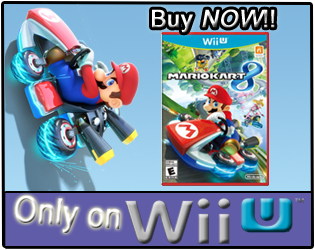 New Super Mario Bros. Wii's Amazon.com sale rank was #3 and it's MSRP is $49.99. According to the NPD data for the month of November, all three of these games were in the "Top 10" for software sold for the month. 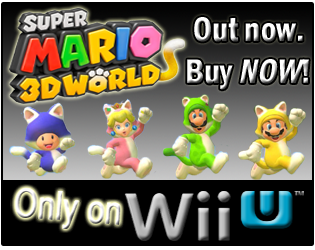 New Super Mario Bros. Wii sold 1.39 Million copies. Wii Sports Resort sold 720.2K copies. Wii Fit Plus sold 679.0K copes. As the picture shows, New Super Mario Bros. Wii has the highest review score average, being at 87% out of 100%. Both Wii Sports Resort and Wii Fit Plus have a review score average of 80% out of 100%. New Super Mario Bros. Wii hasn't been out a full month yet, but it has already passed a casual game like Wii Fit Plus, and has almost passed a core game like The Conduit, in the number of players that are reporting data for it on the Nintendo Channel. The sale ranks for the three games on Amazon.com, probably don't reflect the true sales, because Amazon.com did actually sell out of New Super Mario Bros. Wii, and won't have the game back in stock until Dec. 13! While Amazon is doing pre-orders, it's probably definitely affected sales of New Super Mario Bros. Wii, with customers going elsewhere to buy the game online. So, this will be my first "prediction" or maybe stating a "Captain Obvious", but I'm going to say that New Super Mario Bros. Wii will cross ONE million total hours played, by Monday, December 28. What week do you think New Super Mario Bros. Wii will cross one million total hours played? Just as an FYI, the data on the Nintendo Channel only updates on a weekly basis, not daily. In North America, it updates every Monday, which if you check, you'll notice the Monday I guessed was the Monday after Christmas!